On Thursday, June 1, 2017, at approximately 11:25 PM, an unknown white male was recorded on video attempting to set fire to the Daniel Boon Inn, 130 Hardin Street. 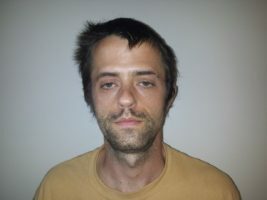 Today, Boone Police Investigators arrested Peter Spencer Horn, 31 years-of-age, of Grand Boulevard, in Boone. Mr. Horn was charged with Felonious Burning Other Buildings in violation of North Carolina General Statute 14-67.1. Mr. Horn was taken before a Watauga County Magistrate where a $10,000 secured bond was set pending a July 21, 2017, appearance in Watauga County District Court. In the fall of 2016 two Tsunami surveillance systems were installed in the downtown Boone area. Video from the Tsunami surveillance system led to the identification and eventual arrest of the suspect in this case. We would also like to thank the public for the tips we received through High Country Crime Stoppers.